COLD HARVEST Brussels sprouts thrive along the cool, foggy coast between Monterey and Pacifica. Ten years ago, "locavore" was anointed the 2007 word of the year by the New Oxford American Dictionary. Since then the idea of wanting to eat closer to home and in season has only gained traction, which has naturally invited skepticism. Number crunchers have found enough cases of it being more carbon-friendly to purchase food from far away that, if saving the world is the goal, the locavore case could be sunk. Pierre Desrochers, co-author of Locavore's Dilemma: In Praise of the 10,000-Mile Diet, argues that it's more energy-efficient to ship a tomato thousands of miles in winter than to grow one in a heated greenhouse close to home. His calculations miss an important X-factor: few locavores have much interest in a fresh tomato in the middle of winter. They tend to taste like red snowballs. Best to wait until July. But if it's a salad you want, you don't have to wait until summer for local produce. Once upon a time, a winter salad didn't even contain leaves, much less tomatoes, and was made of shredded roots that had been squirreled away during warmer times. Such a meal was originally made possible by the advent of root cellars and other winter storage facilities that kept certain crops cool but not frozen. Today at grocery stores and winter markets, it's easy to acquire a rainbow of tubers and greens. I just returned from the winter market with carrots, purple and white daikon radish, Brussels sprouts and onions. Nowadays, a winter salad can mean more than roots and cabbage. Greenhouse innovations have ushered in a winter-salad revolution on par with that brought on by the advent of root cellars. 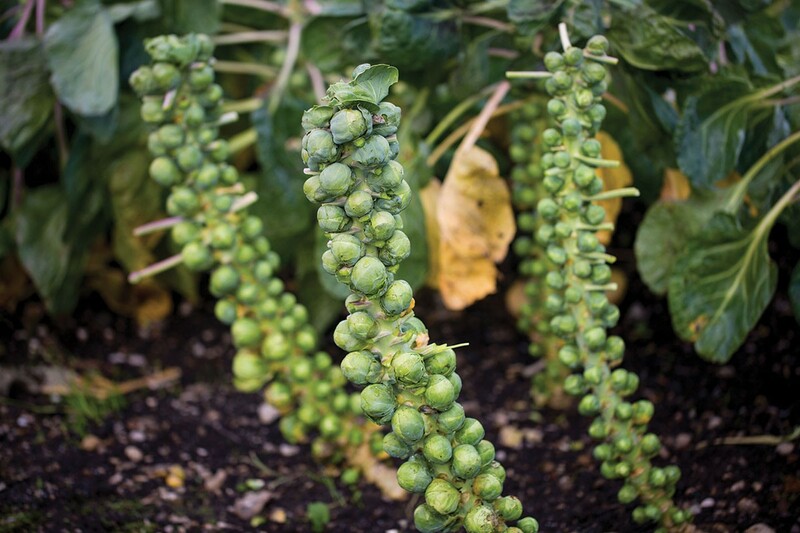 And in coastal California, Brussels sprouts are hitting their prime now in the waning days of winter. This recipe comes fron consummate gastronome Allen Broach of Greensboro, S.C.
Marinate onions in 1/4 c. vinegar, olive oil, garlic and salt and pepper for at least 30 minutes. The inner core of the sprouts, which haven't yet differentiated into leaves, can be thin-sliced. For the balsamic reduction, heat a half-cup of balsamic on low, allowing it to slowly thicken to about half the volume. Toss with pomegranate seeds and the onion dressing. It's special. And local enough.